So I found a couple cheap power supplies for bench testing early bally/stern displays. These are made for running Nixie tubes and I wonder how different that is from bally plasma displays. The 100ma supply should be sufficient for this but I am not an electronics expert. I only test 1 display at a time and currently test all digits at once. Do you have your own software/hardware solution to do this (test all digits at once)? Bally/Stern only display one digit at a time on any display. 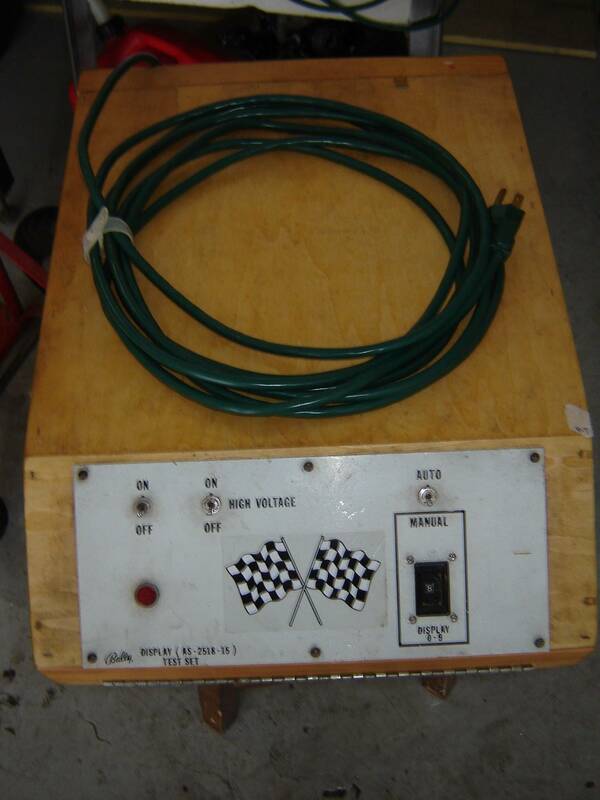 Have you tried measuring the HV current draw with your single display test being powered from a Bally/Stern SDB? I do for LED conversion displays. I keep seeing ads for this Zaccaria/Bally/Stern display tester here on Pinside. Have you checked that out? yeah that's what made me think of this. The price is fine but the $25 shipping kills it for me since I already have a partial solution. Exercise caution with what you do here.. I'm guessing you'd like to see if you can fake signals at the .156 header for the plasma displays, as I described in the Pinitech RETROFIT instructions. As already mentioned, the original plasma displays were engineered with the multiplexing design of the displays in-mind. It may cause damage to attempt locking on a digit with constant current, without any multiplexing happening. Any homebrew or aftermarket display testers should probably follow a similar multiplexing rate as the machines are doing, to avoid any unintentional over-current conditions on plasma / LED displays. Even just in regard to aftermarket LED displays, there's a few using low ohm value resistors on the segments that at FULL BRIGHTNESS are then *fully* dependent on the multiplexing of the machines to be within safe operational limits of pulsed current to the LEDs. Signals faked at the bench and displays at full brightness would damage the LED segments on some of these displays within seconds... burning them out completely or damaging them to the point they only light dimly. 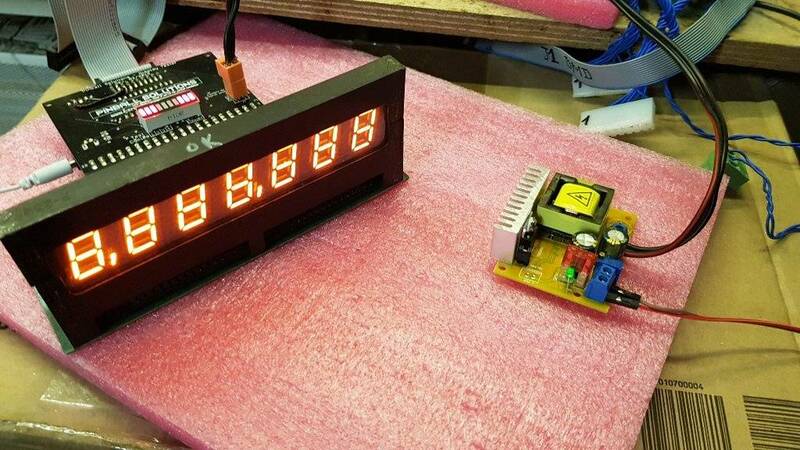 The LED displays I sell were all designed to not drive the LEDs so hard, which is why on my displays you can fake signals at the bench to lock on a digit continuously for testing purposes. Won't work on some other aftermarket LED displays and I'd imagine plasma displays would be in a similar boat of being damaged without multiplexing happening. OK this is some good advice here and I'll take it. 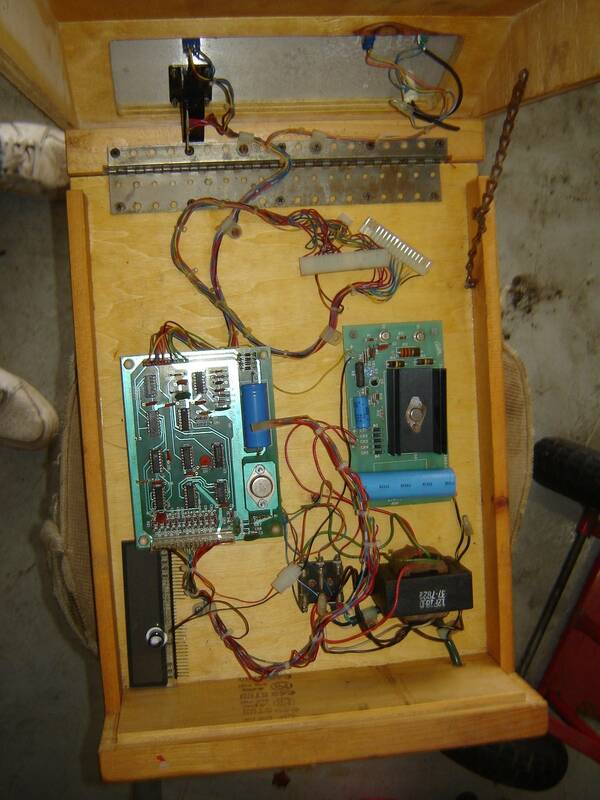 If I was to grab the pinballcentereu tester could it be driven by the power supplies I mention above? Not sure, I haven't actually attempted this myself to know what the minimum recommendations would be for a power supply. I'd imagine Gianfri / Pinball Solutions could make a suggestion and/or comment on what you've selected there since his tester was intended for use with plasma displays. Might also want to ask if the multiplexing is happening at a similar rate as the original machines while you're at it. Regardless, at least his tester is doing multiplexing in some form and will be safer than sending constant locked-on current to the display. he's here on pinside let's see if he'll weigh in. Hey gianfri can you weigh in? They still use nixie tubes? They make some pretty cool clocks out of them. Yep, most of what I've seen people using them for nowadays are novelty desk clocks. 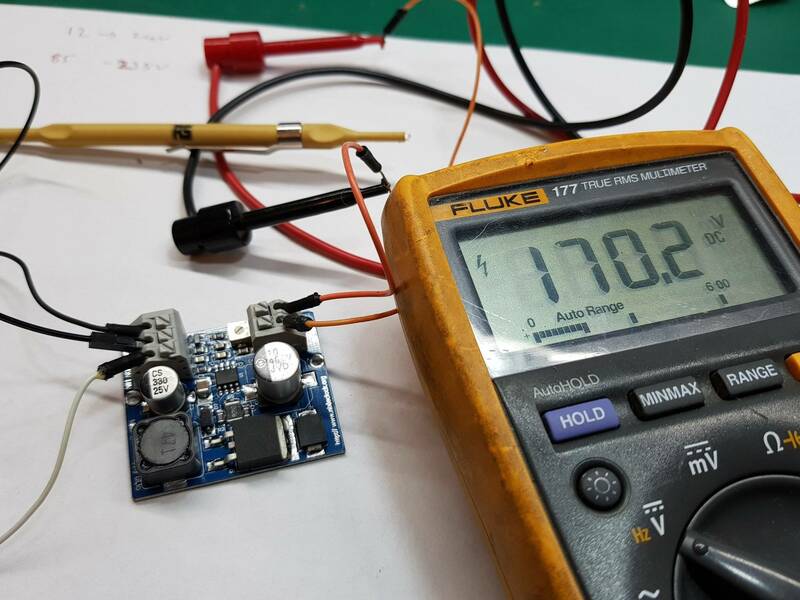 Few answers, as said by Wayne, my tester doesn't force any segment or digit at any moment therefore no risk to damage either LED or Plasma display because it's compatible with all aftermarket LED displays, even the ones with low resistance. Last weekend I decided to get rid of a pile of old zaccaria damaged displays and I used my tester to test them and detect was was wrong. In few hours I tested more or less 30 displays and recovered/repaired something between 10 and 15 of them. the testing goes so quick when you know what to look for that you really save a bunch of time. On bally is even easier because you only have one IC and in most of the cases if you have no data it's the 4543 to be replaced otherwise it's the plasma display itself or some transistors when segments/digits missing. So you would wonder how do I test them? 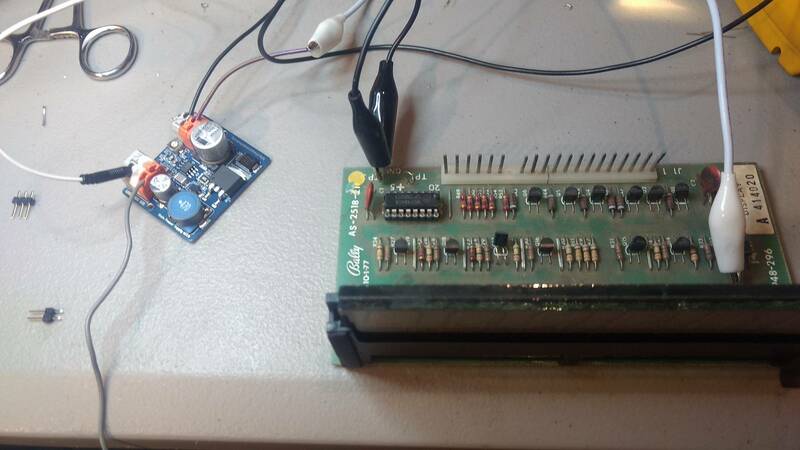 I have two test benches for Zaccaria and therefore I have the Zaccaria power boards which provide me with the 170v current needed for both Zaccaria and Bally. Now let me be honest with all of you, some of you know how much time we can spend in inventing/developing some test boards (Wayne???) and how few of them are sold around and that's one of the reasons why I never wanted to invest more in finding an external power source for HV, just because I have literally no more free time for this and the hours I would need for it wouldn't be paid off by sales. Last thing, since Cheddar just came up with this topic and the shipping fees, I'm happy to give a 10$ discount off the shipping fees for the ones here who want to get one tester V2, but this will require some delay in shipping as I won't be able to ship them before Monday the 11th of February. You can PM me in case of interest. That's all for the moment, hope I could answer some of your questions. Good enough for me. I'll send a pm to order a tester and I'll order up one of the nixie power supplies and let everyone know what the results are. Fantastic, I don't hide the fact that a feedback on those steppers would be really apreciated. 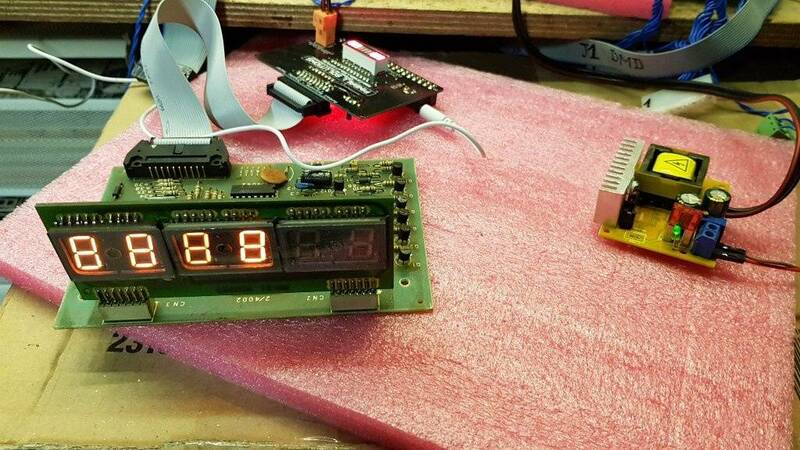 @ZITT made a score display with nixie tubes for his Star Trek "Mirror Universe" build. Freaking awesome. Hooked it up to a garbage display and got the glow. Waiting for my tester to give it a real try. I wonder how long the tester will take to get here from Ottignies-louvain-la-neuve? That's surprisingly quick. What carrier is used? In the US it's $10-15 just to ship a 3oz package out of the country.. rates jump pretty quick as the weight goes up... $20, $30, $50... On the positive side, packages do reach the destination countries quicker than before 2014.. used to take 2-3 weeks or more for First Class International. Hope you sell a lot more of these Gianfri! Test equipment needs some more love/sales. It's nice that some people make this stuff available even though some of it only sells a handful of units a year. I think being able to make a few suggestions on a power supply like Cheddar is trying out will help it sell too. I love these little testers. I think I own the suite of pinitech and siegecraft testers. I have my eye on some gottlieb sys1 and 80 testers in my future too. Well, logistic is quite a mess over here. In Europe we have different postal services for each country and different tariffs too. I'm therefore obliged to juggle (is it the correct word?) from one service to another in order to find the correct option for national, international, intercontinental shippings. Shipping to France doesn't cost the same as shipping to Germany nor Italy or UK. Then you have USA, Canada and Australia where each one has different tariffs too and different delays. Australia it's quite long to deliver, Canada is ok unless they decide to go on strike like in December, two customers were waiting for more than one month to get a parcel. US is ok, in general it takes one week as I said, I can follow the tracking and it's more or less like that. And yes, I have been informed that USPS has increased the postal fees over there which is not a good thing. You motivated me and tonight I tested my voltage stepper which was sleeping on my shelves since ages. In the picture you have a defective display with 4 working digits. Now good night from Europe! Sweet that looks like the same voltage stepper i bought! I tested it could adjust to 180v but never hooked it up to a plasma because i wanted to drive it multiplexed. Crap I would have bought that one for the price. Although if the Nixie board works it can almost be mounted on the tester. Edit: only 20ma. So my board at ~50ma should work fine. If you are in the US (i.e. 120VAC) then with about a dollar or less worth of parts you can easily get 162-163 VDC no problem. The current is controlled by a single resistor and can be pretty much whatever you want it to be. I have a small board which contains 2 of these circuits which I use to drive 51 RED & 17 BLU LEDS each (102 RED & 34 BLUE LEDs total). I have it to output 20ma which is standard for LEDs. 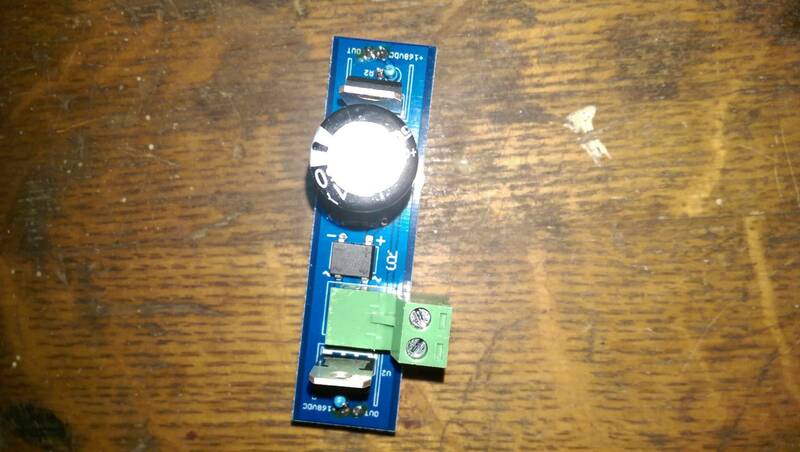 If 163VDC is enough voltage then this would work easy. I include a photo of the board I created. The connectors for the 163VDC output is at each end of the board on the backside (it plugs directly into the board containing the LEDs) and the 120VAC is connected to the screw terminal connector which is a plug-in type. And that is it. Only one set of the first three items are required and you can have multiple sets of the last two. I have been using this for a long time and @20ma it doesn't even get warm. This baord is 20mm x 74mm but could be smaller if only one regulator required. BE VERY CAREFUL WITH THE VOLTAGE INVOLVED!! I'd imagine plasma displays would be in a similar boat of being damaged without multiplexing happening. I have on several occasions hard wired GND to the collector output of a particular segment locking that segment on for all digits to see if the problem is drive circuit or display related. It is a little bright but no problems occurred. I don't leave it on a long time - maybe 5 seconds after it goes through boot-up. This is with AS-2518-21 displays. Thanks Dayton for your picture, looks nice and of course it perfectly fits the US market! I need to get one of these now! tester is due for delivery today but I had something else that needed help. I did not adjust the stepper output voltage (left it at 170) but adjusted the output on the SDB to the same. I'll fine tune it in the machine. Yes, I got the notification! Got the tester today with a lovely assortment of stamps. In exactly 7 business day. I put a .156 header pair on mine as I'm hoping to just mount the nixie board on it. If you are in the US (i.e. 120VAC) then with about a dollar or less worth of parts you can easily get 162-163 VDC no problem. 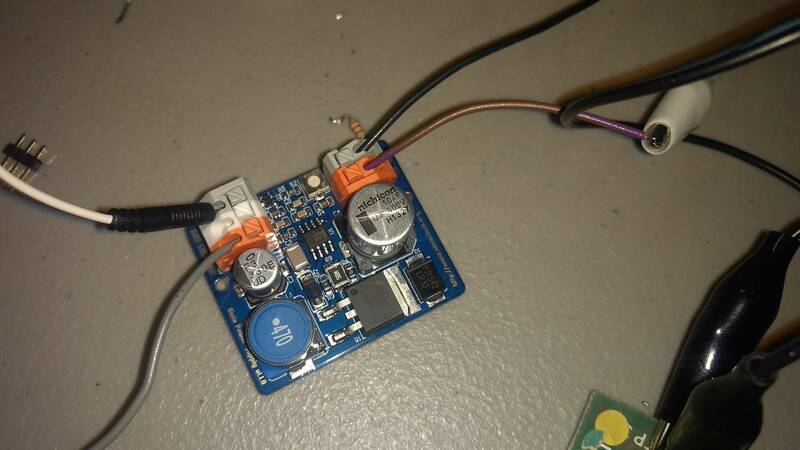 Are you really using an LM317 in an HV environment? Cool! 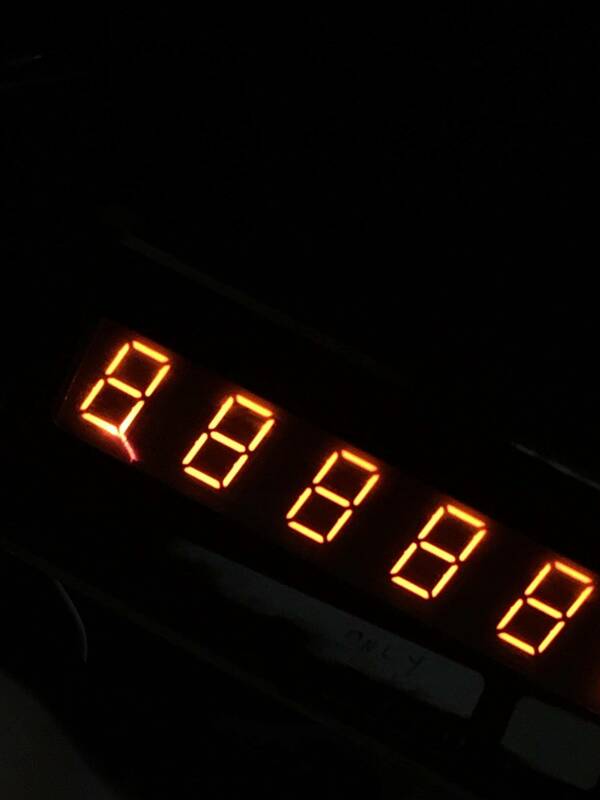 When you get a display fully working, I'm interested in hearing if the digits seem to light brighter than when installed in a game or if they look about the same. From the videos I've seen, it kind of looks like when in single digit testing mode, the digit lights brighter than when it's multiple digits being lit? Using the tester I found the solution for 1 bright digit = Replace digit driver and level shifter and fully working display! That is absolutely the case. Individual digits are bright and they dim when all are lit. I don't this will be the issue for LED displays. I'm working on some conversions now and I'll upload a vid when I can test the first one. 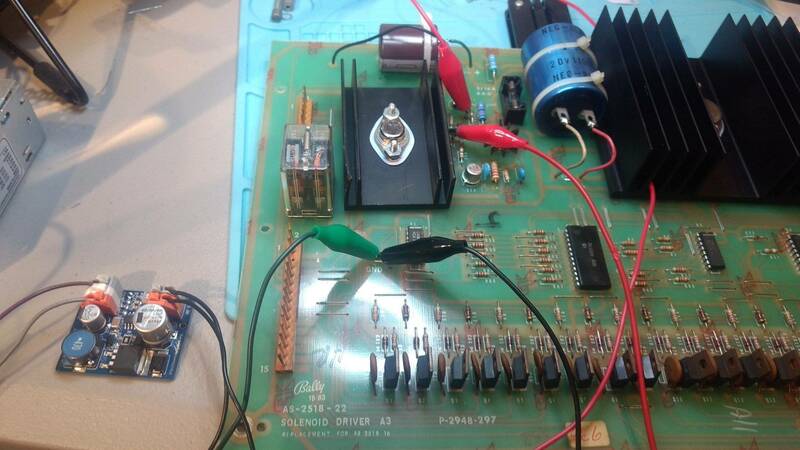 Rottendog uses a LM317AHVT in their HV section on their replacement Bally solenoid driver board which can run at the limit of max dropout voltage spec.. Yes - he does use the LM317AHVT and the LM337T. Is it a sound design? No. With their output voltage set around 180 volts and an input voltage that can be over 240 volts.. The tiny heatsink the 5V regulator is attached to gets very hot I hear. Anyway we're getting off topic. Personally, I like Chedder's use of that boost type switching supply. MUCH more efficient than using a series pass regulator. The reason for the excessively sensitive dial is the quite tiny radius of the trimmer that they used. The smaller the radius, the less granularity you get. But for how he is using the supply - it doesn't really matter. Yes, for several years now. 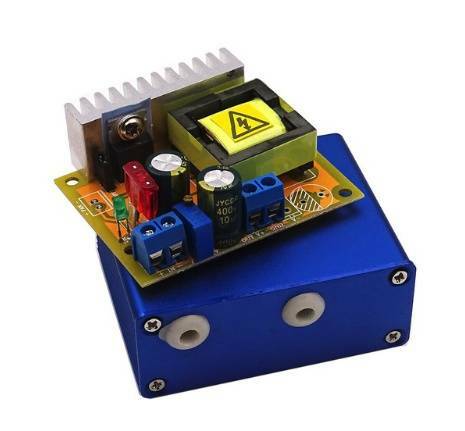 It is used as a constant current source, not to regulate any voltage. The 163VDC comes directly from full bridge rectifying the 120VAC. 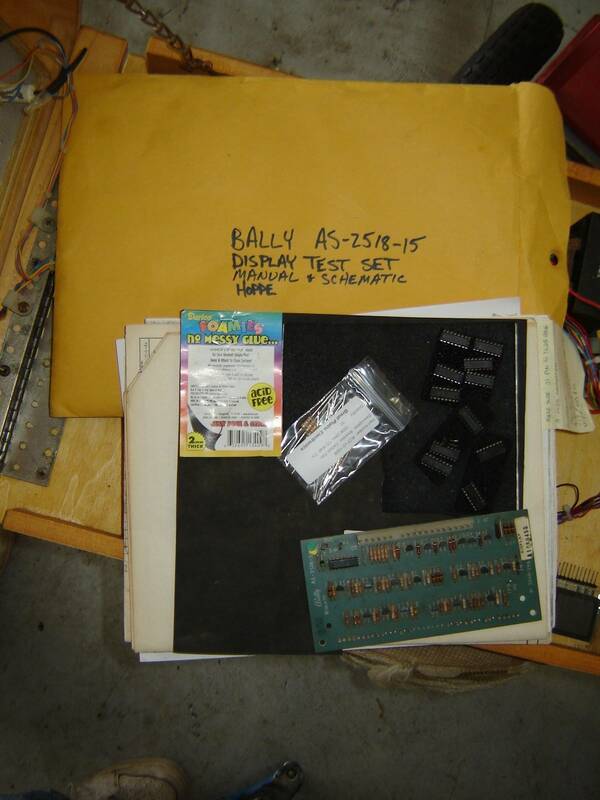 I have thought of selling my Bally "Brown Box" Display tester from time to time. It would be hard to part with due to the TLC myself and Clive Jones gave it. I guess it's gotta' go somewhere before I croak, and the clock is ticking. If there is enough $ interest, I'll eBay it away I suppose. Actually this may not be to difficult to make copies of. While there's no way I could afford it I'd love to see some pics of it. I'll try to post some pic's at some point. It's not brown anymore, I had to make a new cabinet for it, I copied the original to a Tee though. Socketed all ic's put in a new cap, made an extra cable, new long power cord. Maybe lost my mind a bit when I reconditioned it but I do that regularly when I shop a game so... what the hell.